Below is a list along with a brief overview of the initial offering of Dvault parcel drop boxes that USA Building Supplies has made available to end users on their website recently. Full Service Delivery Vault – The full service delivery vault is the ideal solution for customers who want a receptacle that receives both letter and package delivery from the U.S. Postal Service. This drop box offers the customer a separate area for incoming letters, outgoing mail, and packages. This parcel drop box is manufactured from 16 gauge galvanized steel and has a durable powder coat finish. Curbside Delivery Vault – This package drop box feature a front access drop door and rear package retrieval door. This parcel drop box is known for its large capacity and security. The curbside delivery drop box is offered in gray, black, white, sand, or copper vein powder coat finish. Secure Collection Unit – Unit is front loading for depositing packages and retrieval of parcel and or items for the end users. End users tend to prefer this drop boxes’ dual front access feature because it can installed in front of a building wall. All secure collection drop box purchases include a plastic bin for item and or package collection. Pedestal Mounted Delivery Vault – Sometimes, it is necessary to elevate your package drop box due to weather conditions or other reasons and the pedestal delivery vault allows for this. The 10” high mounting pedestal and drop box are fabricated from 16 gauge steel and powder coated for all weather durability. USA Building Supplies’ management stressed that additional Dvault product offerings were in the plans for the future. In addition, custom options for package drop boxes are available, but usually require minimum order quantities. Courier drop boxes are reaching peak demand at USA Building Supplies. 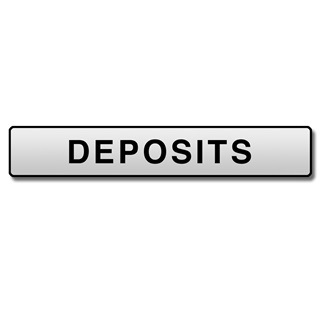 This package drop box has been purchased for a variety of reasons and applications. 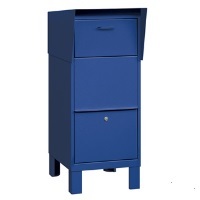 Customers love the durability of the drop box because it is manufactured of 14 gauge steel. The courier box is appreciated for its versatility for the reason it can be used indoors or outside. Clients rave about the security the courier box offers with its three point locking system. This package drop box can handle different package sizes due to its spacious drop box opening and user access door. The courier box can be ordered in four different powder coat finishes or in custom finish for an extra cost. The courier box is being utilized more often as prescription drug drop box. Police stations, fire stations, pharmacies, municipalities and others are joining in the efforts to keep prescription drugs from entering our water supply because the public flushes the drugs down the toilet. This drop box is being used by residents for packages ordered over the internet that are delivered when they are not home. Military installations continue to utilize the courier drop box for contra band and other uses. Parcel drop boxes have been utilized more often by homeowners with more people shopping everyday over the internet. Residential shoppers have grown frustrated when they have ordered products online only to never receive the package. This situation precipitates a call to the vendor to find out what happened to the package. Many times the package has vanished because the parcel was taken right off the homeowner's front porch. The Elephantrunk parcel drop box helps to solve this problem. This spacious locking drop box keeps the packages out of plain view from prospective thieves following the package delivery service truck to target their next victim. The Elephant trunk parcel drop box has three point locking system on the front access door further deters even bold intruders. Many customers anchor the drop box to the concrete which will discourage removal of the drop box all together. Our adjustable leveling feet will assist you in your installation of USA Building Supplies' drop box. The Elephantrunk parcel drop boxes can multiple packages at one time from different couriers. Our package drop box has curb appeal too! It is available in four attractive powder coat finishes with an elegant design as well! our entire line of drop boxes including Courier drop boxes, letter drop boxes and more from the experts at USA Building Supplies. Complete all your building supply needs online today with our premium commercial building products, from 4C horizontal mailboxes and pedestal mailboxes to cell phone lockers and laptop stations.